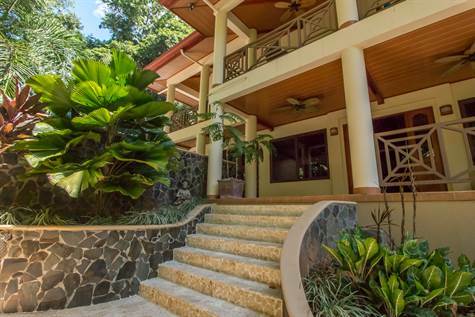 Nestled on it own private jungle along the southern Ballena Coast of Costa Rica this amazing home is the perfect for families looking to relocate. Enchantment begins as you leave the house and walk through the amazing jungle to the beach down below the home. Breaking waves, long beach walks on empty miles of beach, kayaking to the islands out front, or whale watching is everything that is available from this luxury 4600 sq ft. estate. Just of the coastal highway the exquisite house is perched within a jungle atmosphere just like out of the story book of Tarzan. With monkeys making daily visits and several different species of birds, this is natural wonderland that every one will love. The main house features 4 bedrooms, and a guest casita includes it own bedroom suite. Three of the bedrooms are located on the 2nd floor of the house overlooking the jungle and pool area. The house was built in 2008 and includes a swimming pool big enough to swim laps with an additional small pool section for the kids. A two car garage, bodega, large covered yoga or workout studio, game room, and BBQ area for entertaining, all make this house a must see if looking for a second home or place to rest your hat.